PonderWonders: The Suite Aroma of Joe's Morning Cafe! The Suite Aroma of Joe's Morning Cafe! You all should know by now that I am always searching to Inspire & be Inspired! And if you didn't know that, well, now you do. As a matter of love, I find joy in the simplest of things. Like for instance, greeting you all with "Hola" in every post or ending it with "Tootles". These are not just words you know. I don't just write words. I completely and utterly feel each one! Why you'd probably think I'm crazy if you heard me write! For example, when I greet you with "Hola" you could bet your life that I'm saying it with gusto everytime! I feel it from deep within the heart! And when I finish with "Tootles", I say it with excitement because I can't wait til next time to say "Hola" once again! You know what I mean? It's sorta like, when you grab that first cup of morning coffee and you feel it's warmth in your hands and you raise it ever so gently towards your face teasing your nostrils with it's sweet strong aroma and then you stop! And then....you breathe in the aroma and you taste it! And the aroma and taste releases in you a nice, strong sense of well-being. Ahhhhhhhhhh. Then, it lifts you up, it gives you strength! You raise your head up high now ready for the day! Ready to face any challenge that comes your way! Feels nice, doesn't it? Well, that's what Joe's Morning Cafe is all about! Stay tune for "Meeting Joe". Who dat be?! Lol Can't wait too meet Joe! Can I Make My Life Count?....My Bucket List! "Getting My Sexyy On!!!" with Pole Dancing!!! "I am the Alpha and the Omega. "..NOT religion! 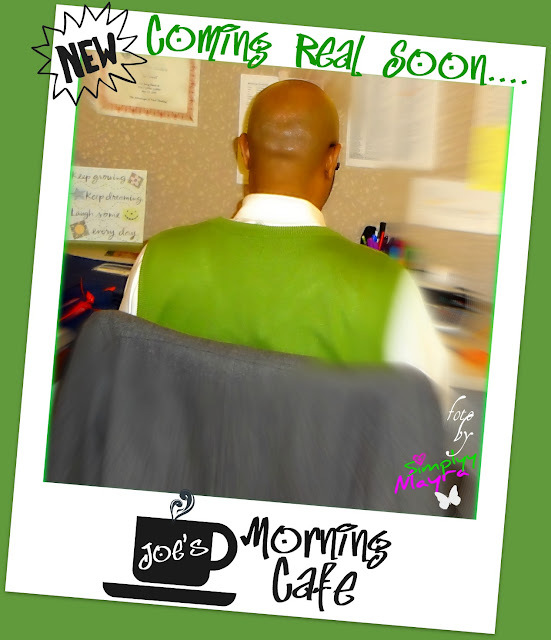 "Meeting Joe C" of Joe's Morning Cafe! SimplyyMayra...A new Keek! "Oh Nooo!" Bright & Shiny Blue Pinwheels! Supporting "US Everyday People" Too!